Players from Team World knocked Team North America from pillar to post in the annual event to build an impressive 16-5 lead mid-way through the competition, only to see their opponents claw their way back to within five points Saturday night with a big performance. But Team World said ‘enough of this’ Sunday morning, taking 11.5 of the 15 points available in the three Skins game to take a stranglehold on the competition at Orleans Arena. The additional points gives Team World a 29-16 lead heading into this afternoon’s final draw of three Skins matches where the final 15 points are up for grabs. The first team to hit 30.5 points, the minimum required, will win the championship. Team World needs a meagre 1.5 points this afternoon to reach the summit, snap an ugly six-year drought in the event and pocket a tidy sum of $85,000 Cdn for their efforts in the four-day global rockfest. While it looks to be over and everybody knows it, although some players on Team World were being very diplomatic after the morning draw. Eriksson said Team World players were still upbeat after being swept Saturday night. Nichols was downcast after the loss. “After last night there was a lot of energy in the room and we felt we were climbing back into it,” said Nichols, who was supported by third Jamie Sinclair (Manitock, Ont. [representing U.S.], second Brett Gallant (St. John’s) and lead Taylor Anderson (Minneapolis). “But obviously the result from this morning wasn’t what we needed. I struggled today. There were missed shots from me that could have changed the game a lot. 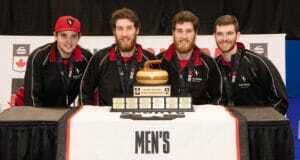 The one bright spot for Team North America was the play of Jennifer Jones and her team from Winnipeg. 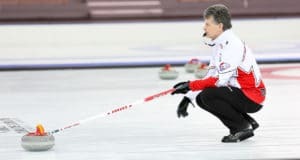 Jones defeated Team World’s Silvana Tirinzoni from Switzerland 3-2 in points in the women’s Skins game. It could have been better but Jones lost the final point, a carryover, in a draw for closest to the button. 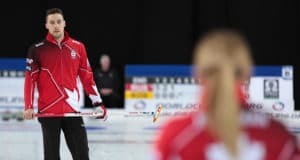 Swiss skip Peter de Cruz and his Team World squad whitewashed Team North America’s John Shuster to pick up all five points in the men’s Skins game. The final draw of Skins games will commence at 4 p.m. (PST).